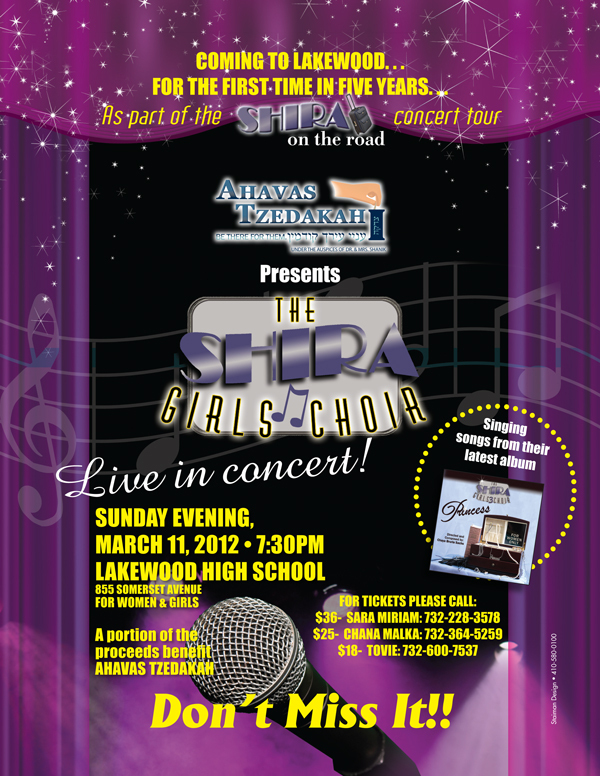 Ahavas Tzedakah of Lakewood under the auspices of Dr. and Mrs. Reuven Shanik presents The Shira Girls Choir in concert. Women and girls, join Ahavas Tzedakah on Sunday night, March 11 at 7:30 at Lakewood High School, 855 Somerset Avenue, for a professional evening of song and dance featuring the talented members of The Shira Girls Choir. At the show, which is part of “The Shira on the Road” concert tour, the choir will present songs from their newest album “Princess” all sung expertly by the choir as well as songs from their other albums “Yisimeich Elokim” and “Lechu V’nailcha”. Shira Girls Choir concerts are known for their dynamic singing, flawless choreography and astounding costumes. Tickets are $36, $25 and $18. Don’t miss out on what is sure to be an unforgettable and enjoyable evening and help support Ahavas Tzedakah at the same time!